I am struggling to see what is being celebrated here. The UGCC was formed in Aug 1947. 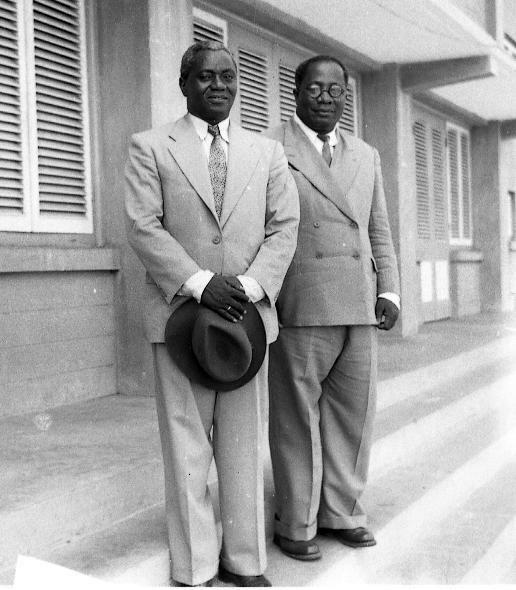 Nkrumah joined as SG four months later. As a colonial office dispatch observed, prior to Nkrumah’s arrival in December of that year the movement’s main supporters were “in the large coastal towns of Accra, Saltpond, Cape Cost, Sekondi and Kibi the home of Dr Danquah”. Aiken Watson of the eponymously named commission he chaired conceded that the UGCC did not get down to business until Nkrumah arrived. The post war austerity boycotts and exservicemen changed the course of history. The infamous shooting of ex servicemen who sought only to present a petition to the Governor’s office did not include UGCC officers or members. While Nkrumah and Dr Danquah had met members of the legion the day before to help with drafts, the UGCC was not involved in the march and in fact disavowed the riots that broke out following the unlawful murders of three ex-service men; they blamed it all on Nkrumah. William Ofori Atta and Obetsebi Lamptey ransacked his apartments looking for incriminating material to use against him. But it WAS precisely these riots that led to the arrest of key UGCC officers (earning them the dubious sobriquet of the Big Six) and the establishment of the Watson Commission which recommended the appointment of a Constitutional Committee to draft a new constitution to pave the way to self government. The Coussey Committee included UGCC officers who repudiated the riots that created the circumstances for their membership and many sections of society except Nkrumah (blamed for the riots that led to the Committee’s establishment) and Trades Unionists. Even with the scales tipped in their favour, the UGCC managed to botch the elections organised under the auspices of the constitution they drafted and gerrymandered rules they defined and lost in a landslide to the CPP. And with that, they passed on to Nkrumah, who they excluded from the Committee, the mantle of carrying through the programme for self government. That was momentous! It is probably THE day worth celebrating : when Dr. Danquah’s command of Gold Coast politics ended and Nkrumah’s took off. So what exactly are we celebrating? What was the singular contribution of the UGCC to an independence struggle they did not trigger? The 1951 constitution? which prominent members among them (Ofori Atta and Dr Danquah included) and Nkrumah described as “bogus and fraudulent”? The UGCC were not the handmaidens of our independence. They had no role in the events that caused the British to initiate the process of self-government with the establishment of the Coussey Committee – Nii Kwabena Bone, his boycotters and the ex service men did. They could not win the first All-African general elections whose rules they wrote and they ceased to exist after the 1951 elections and reconstituted themselves into various opposition parties whose raison d’être was to stop Nkrumah from leading Ghana to independence. This is a celebration of a party with no singular political achievement or historical contribution! Here is the crux: There is a dangerous historical conflation here; of projecting Dr Danquah and the UGCC as one. Dr. Danquah’s contribution to the anticolonial struggle is immense and it predated the UGCC by more than a decade. An intellectual colossus of all time, he paved the way for Nkrumah and those that came later. But Dr Danquah’s achievements are not the same as those of the UGCC. In fact by the time of the establishment of the UGCC Dr. Danquah had peaked. His best and most productive years were prior to that. I have no qualms about celebrating Dr Danquah’s contribution. It has meaning. The celebration of the non-performing UGCC with no singular political achievement makes no historical sense. To the extent that the UGCC achieved anything it was their invitation of Nkrumah to head the party’s secretariat which together with the boycotts and riots altered our history. But that too was Dr Danquah’s (and Ako Adjei’s) achievement – perhaps his final and crowing glory. In battle, business and in politics, sometimes the best and most transformative decisions are in the choice of personnel. The choice of Nkrumah was the finest decision Dr Danquah made – it gave finality to his life’s work.